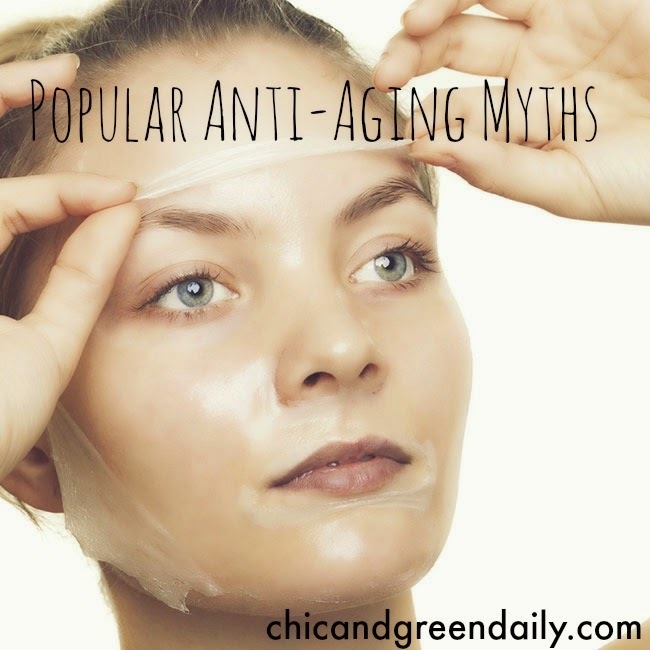 Today we’re going to dispel some anti-aging skin care myths. We’ve all heard them. We’ve heard the outrageous product claims and slick magazine ads. Chic & Green takes a look at 7 of the most common skin care myths and truths. Myth #1: Dry skin causes wrinkles. Truth: Dry skin does not cause wrinkles. A breakdown in collagen is what causes wrinkles. 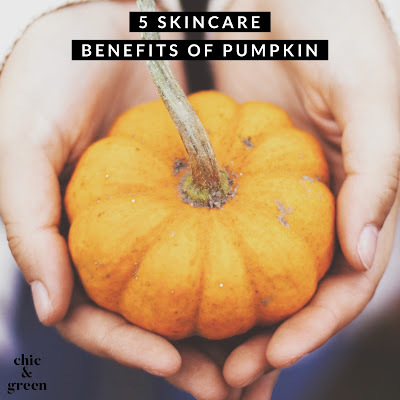 Dry skin will most definitely make wrinkles more obvious, but skin hydration has nothing to do with whether or not one will develop wrinkles. Myth #2: My mother looks very young for her age, so I will too. Truth: While genetics do play a small role in terms of aging, lifestyle habits have a much greater impact. If you are smoking, eating a poor diet, and skipping sunscreen, your genetics will not help you stay younger looking. These lifestyle choices have much more of an impact on your skin than genetics. Myth #3: Moisturizing faithfully will help prevent wrinkles. Truth: Regularly applying moisturizer will help your skin stay hydrated, but it will not prevent wrinkles. You can apply all the moisturizer you want to and there will still be no impact on wrinkle prevention. Moisturizer will add hydration to the top layer of your skin. It has no impact on wrinkling. Myth #4: It’s cold and cloudy so I do not need sunscreen. Truth: You need to apply a broad spectrum SPF each and every single day--rain or shine. The fact is that your skin is still exposed to UVA rays (the aging rays) even on a subzero cloudy and snowy February day in Upstate New York. The sun’s rays are the number one cause of aging and everyone should be applying sunscreen before going outside. Myth #5: The ad said that I will look younger in just 7 days. This has to be true, right? Truth: Unfortunately, this is just a tactic to get you to purchase the company’s products. The FDA does not monitor or control the claims made by the skin care and cosmetics industry. You have to take these claims with a grain of salt and do your own research. Just because the company selling the product promises you the fountain of youth doesn’t mean that it will happen. Myth #6: You can exercise your facial muscles to get rid of wrinkles. Truth: No, this is just a myth. We’ve all seen those facial exercising machines late at night on home shopping television channels. Stretching and making exaggerated facial expressions with a special “exercise” gizmo for the face could actually cause you to look older, so do not waste your money. The muscles on your face are unlike the muscles in other parts of your body. Do your facial muscles have the ability to get bulky like your biceps? No. There is no evidence that facial exercises will erase lines and wrinkles. In fact, doing so is more likely to create lines than diminish them. Myth #7: Expensive anti-aging skin care products are always better than drugstore ones. Truth: What matters the most in a skin care product is the quality and concentration of ingredients used. You might actually find that are $30 serum works better on your skin than a $100 one in fancy packaging. It’s what is in the product that makes it good or bad. Product efficacy does not always have to do with the price. Remember that there is no such thing as a cream to remove wrinkles, so do not buy into the slick marketing campaigns. That said, please know that you are not very likely to find $10 serums with peptides and potent actives. Why? These ingredients are more expensive, which will make the product more expensive. When it comes to cleansers, toners and body care products save your money. Splurge on your serums and targeted skin treatments. We all want to prevent and correct the signs of aging, but the most important tip is to take good care of yourself and treat your body with respect. Eat fruits and veggies. Stay hydrated. Wear sunscreen. Don’t smoke or use alcohol in excess. Take time to be out in the fresh air being active. Choose your products wisely and don’t fall victim to the latest product advertisement promising you the fountain of youth. And now the nitty-gritty: What can I do to help prevent and correct the signs of aging? There is no magic pill or product to just erase wrinkles, but there ARE many things you can do to help your skin look younger! Stay tuned for part 2 on skin and aging tomorrow on the blog. 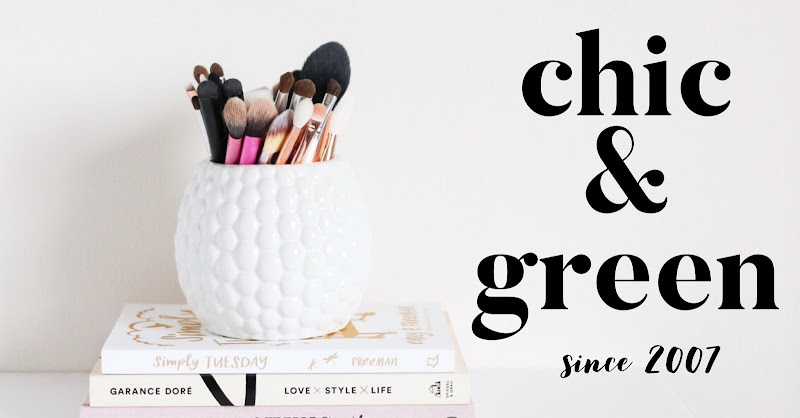 Chic and -- Not so green?